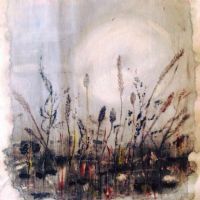 Based in County Down, Ruth creates mixed-media original works on Irish Linen. She is inspired by the landscape and flora of the local area, the changing seasons, the stillness and luminous light of the landscape and the Strangford Lough coastline. Her work combines printed and painted elements with each piece being unique and instilled with a sense of place. She brings together both real and imagined elements and experiences to produce truly original pieces of art.